I meant, the tension will be expanded to the whole wire. If you have a CoreXY with 2 m wire and you stretch your pulleys by 1 mm with 2 loops, you strech the whole line by 2 mm / 2000 mm, by one promille. The stretching between the pulley will be leveled with the rest of the line after a few rotations. (the line tension will have an effect on the tension on the wired line and so on, until the whole line will have the same tension). I'll try both possiblities to be sure. Edited 1 time(s). Last edit at 05/27/2018 11:03AM by JoergS5. In one thread I read,it's very important that the grooves are very exact. Otherwise you will directly see it in the 3d print. I think about using two short parts of a 20x2 trapezoid spindle as pulleys. Yeah, if your pulleys are out of round or eccentric, you basically have a variable radius throughout the pulley rotation, giving you a non constant steps/mm. It's why printed pulleys aren't popular or common. I made a short test with the crossed wire setup and it worked quite OK, as long as there's no sideload on the wire. The carrier has to run along the fishing line, which can be done with the offset pivot point idea. I have to redesign my test-frame to digg into that. I still haven't had time to draw it up because it's the end of semester here and I'm super busy, but the happy little discovery was that the winding pitch of the string on the pulley doesn't matter. The only thing that matters is that when the string is fully wound in (i.e. The anchor on your carriage is touching the pulley), the end of the string leaving the pulley and the anchor point on the carriage must be aligned in the axis of travel. As long as this condition is met, you get a constant steps/mm even as the string unwinds and the point it leaves the pulley moves. I tried to setup a offset/crossed-over carrier, but even if the "driving" side of the string is inline with the carrier, there is an issue with the multiple windings on the pulleys. The string moves parallel to the axis while it winds up/down, making it impossible to use a fixed anchor point on the carrier. So I did the only meaningful thing with fishing line and partly replaced the Z-belt of my Kossel XL as a test. It's pretty tricky getting the length of the string right. I loosened the corner screws that are used to stretch the belt. Then I made one long fixed loop and one self-tightening loop. The fixed loop can then be wrapped around the screw until it is pretty tight. Then fully tighten the belt by adjusting the before mentioned corner. Edited 2 time(s). Last edit at 05/30/2018 06:29AM by o_lampe. I found that a strong Kevlar string coupled with an original Gates GT2 belt, with a minimal lenght, gives less ringing... The idler pulley may be a simple V-groove ball bearing, it's very reliable. Edited 4 time(s). Last edit at 05/30/2018 09:29AM by M_Xeno. It was just a test, but I found it succesful for now. The deviation from autocalibration is lower than before ( 0.03~ vs 0.05 ) and I only modified one belt so far. How did you fasten the string to the clip? I might try them, but will add a sleeve around the clip. I hate the tie-raps "barbaric" look. Edited 1 time(s). Last edit at 05/30/2018 12:01PM by o_lampe. Maybe I'm wrong, but the nonlinearity error is very small according to my observations?! The wire in my test setup winds up 4.2mm for a travel of 200mm. While printing smaller stuff in the center of the bed, you won't see any error, but you sure see less ringing! Edited 2 time(s). Last edit at 05/31/2018 04:25AM by o_lampe. You can correct the error directly in software. You know where the position is, so you know the error at this time. The error is nonlinear, so it may be worth to precalculate a lookup table for the positions and corresponding errors to ease calculations for the processor. The error is linear, so it's easy to correct by a stepper correction factor. Edited 7 time(s). Last edit at 05/31/2018 11:44AM by JoergS5. The angle between string and carrier doesn't change. That's the advantage of the crossed string. Thanks for bringing up the word "crossing" Joerg ( in a different context ). It triggered my brain. It's better than linear, it's constant, as long as you spool the wire in the correct direction. Otherwise you have the same changing angle between the string leaving the pulley and the anchor on the carrier. For now the string behaves nicely. Even the returnpath, which has a steep angle, spools up correct. I've only done a few moves by flashing Ramps_test, but today I'm planning a real torture test with Marlin running a mean gcode. I will try your solution for the Y-axis: a double shaft stepper in the middle, connected by two shafts to the side, then ... ok, I made a "professional" picture. I replaced the E'-string of my guitar with the Aramid-string and at first I had to tune it pretty often, but now it has settled. Thanks for the hints, I'll wind them on the shaft first, it's 8 mm diameter. I want to see the resulting quality first, speed is not important. I'll try FireLine 0,1 mm first. To fix the string to the clip, I pass it through the small axial hole, make a stop knot, cut the excess length, and retighten the whole. The stop knot is then hidden inside the clip, it is very clean, and from the point of view of force transmission, it is optimal (symmetrical). Edited 1 time(s). Last edit at 06/02/2018 04:10AM by M_Xeno. Where did you get your Gates GT2 belt from? I've seen people talking about this and have not found a source. I only know Gates GT2 as the Gates Poly Chain GT2. It is different from the commonly used GT2 belt. Teeth of Gates GT2 are 8 or 14 mm distance. Other names for this belt is PC2 8 MGT and PC2 14MGT. There were several new threads regarding cable drive and some of them stopped tinkering and went back to belt drive. I still think, the new found solutions deserve to be collected here for later reference. The rubber surface can help adding friction, but long term test will show how the rubber survives the cable tension. Here's a quick and dirty setup with V623 bearings and 0.5mm fishing line. The vertical offset is set by M3 washers. I don't have a real use case now, maybe I make up a weight lifting rig and use endstops to check for slipped cable. Edited 3 time(s). Last edit at 08/25/2018 04:13AM by o_lampe. The soft silicone rubber didn't make it. It didn't slip at medium tension , but the cable tightened so much, that the pulley diameter changed. The cable almost disappeared in the silicone. If that won't work, I think of an aluminum pulley with sandblasted surface for more grip. Edited 2 time(s). Last edit at 08/26/2018 03:09AM by o_lampe. When you are successful,I will try it also. One idea is to use longer screws in the four corners and stabilize them to put it into an aluminium cage, similar to the stepper cages of digital dentist. So the axes cannot bend. This will allow mounting of the stepper at the top side as well. To guide the wires, I thought about using a steel mesh or a spiral. The wires must be forced to a specific angle between corner and the middle. In your case the wires force each other into this angle, but you have friction and maybe abrasion. So putting something glossy/glibly between the wires lowers the friction and abrasion. If you lower the friction between the wires, your middle axis needs lower friction also. Edited 2 time(s). Last edit at 08/26/2018 06:12AM by JoergS5. Another idea: the screws at the 4 corners: if they are tilted a bit they can lower the force needed. The wire coming from the pulley and going away has a little slope/pitch, you can lower the friction inside the pulley by making the shaft a bit tilted. The tilt is easier to achieve with the cage: the holes at the other side with a little offset. Edited 2 time(s). Last edit at 08/26/2018 06:19AM by JoergS5. Out of curiosity, what's the advantage over just jogging the cable between two axles like in the original design? It just seems like this would be harder to string. I can guarantee that it will be a PITA to string the cable on this design. Even on my last one with just 3 steering pulleys, if there was any problem with the sand table mechanism, it took a solid hour to restring the cables and then tension them again. That's why I gave up on it. It's so much easier to use belts, and they're much more reliable. 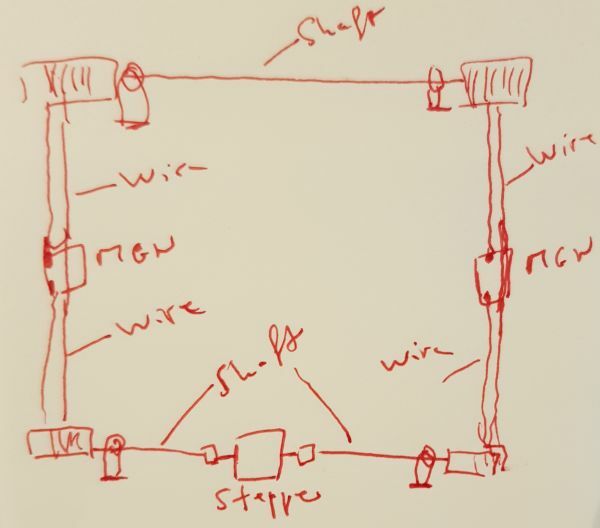 The wires must be forced to a specific angle between corner and the middle. In your case the wires force each other into this angle, but you have friction and maybe abrasion. If I'd use thicker washers to set the vertical offset, the wires wouldn't rub against each other. But it's a good idea. TBH, I haven't tried it with a single multiwrap idler, like polygonhell designed it. What bothered me in his design is the bigger height of the assembly and the higher sideload to the stepper bearing. Here it's is very flat and the tension pulls only at the base of the shaft. Wrapping the cable was easy, because it's still an open design. If I'd use a box, I'd make it with a removable lid. I use some rubber band to fix start and end of the clover. Routing the cable through the whole printer would be a different story. Maybe it helps to fix the cable temporarily with tape or other 'little helpers' to keep it in place before it is tighened. Edited 2 time(s). Last edit at 08/27/2018 12:54AM by o_lampe. I read somewhere that the four corner screw holes are not positioned exactly (it's only the circle around the middle shaft which is positioned exactly). So the distance of each corner may be a bit different to the middle shaft. So the tension will vary heavily when you turn the shaft (distance of incoming and outgoing wire is not the same e.g.). I don't know how to construct it, but it may be a good idea to soften (abfedern) the four corners a bit, because the four corners construct an overconstrained connection to the middle shaft and will slow the movement when you have a little unevenness. Maybe you find an alternative to the V623 pulley which is soft/can relent. 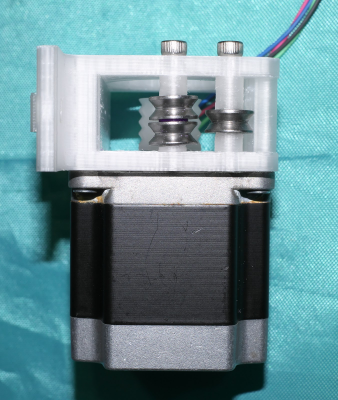 BTW it is a very interesting idea to use the 4 corners, it unburdens the midde stepper shaft. This is different from the original construction where there is tension from one side to the shaft. Edited 2 time(s). Last edit at 08/28/2018 02:53PM by JoergS5. The holes are placed symmetrically around the motor shaft. If they weren't you would be forced to position the motor in a mount in a specific orientation. Who would want such a thing? I have made many motor mounts for NEMA standard motors, always using symmetric screw hole locations, always fitting perfectly. Even if the distances between the pulleys and the shaft were different, it would have no effect on the cable tension. Belts normally load the motor shaft on one side. I don't know why, but people who play with cables seem obsessed with the motor shaft loading. Maybe the whole thing would work better with a larger diameter center pulley. The friction between the cable and the pulley isn't just a function of the angle of wrap, but also the amount of cable in contact with the pulley. Larger diameter means more surface contact. I wouldn't make anything "soft". If you do that you're just reducing the tension by whatever amount the soft material acts as a spring. Soft materials will ultimately get cut by the cable.